A child is a gift of purity, love, innocence and the best of both worlds. 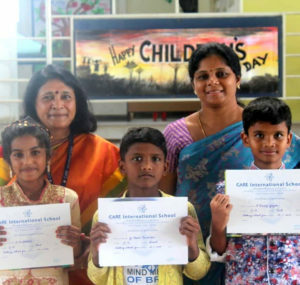 At Care International School,children are the epitome of life. We have always given utmost love, care and affection to the children to nurture them and help in their healthy growth and development. All the children in their beautiful costumes were twinkling like jewels in the night sky. The teachers gave a small program to entertain the children, it comprised of a story rendition by Mrs. Gomathi our Tamil Faculty, followed by a skit on types of mothers and their reactions to the children (Comedy) by Mrs. Soorya Kanthi, Mrs. Prema, Mrs. Alamelu and Mrs. Angel Priya. It was highly hilarious. In the post lunch session, children enjoyed a games fair which had simple games arranged for the children. The primary children had fun with stories, were given personalized photo frames with their best activity photo to cherish as a memoir. The day came to an end in a snap. It was a beautiful day with a smile on each face.